There are so many beautiful things that make up a wedding. Stunning venues, gorgeous flowers, and lush linens. But want to know our favorite part? The cake of course! The ladies of Magnificent Moments Weddings love weddings and the cherry on top of an amazing event is often an amazing cake! 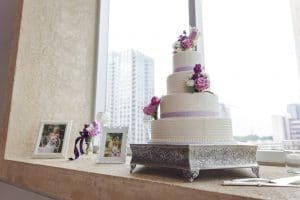 So I thought it would be fun to look back at a few of the memorable cakes our brides have chosen, give you our readers some inspiration and maybe a craving for something sweet! 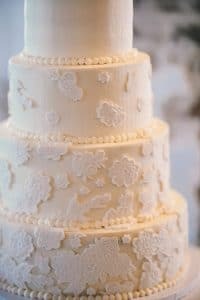 Meghan and Ryan chose an simple white cake from Deserts by Dawn for their Uptown wedding at The Mint Museum. What made it really stand out though was the touches of purple, which tied in perfectly with the events decor. Kara and David chose a unique cake by Wow Factor Cakes. The varied texture in the layers create dramatic interest. Not to mention the blush color is swoon worthy! It really was the centerpiece of their wedding at The Mint Museum Uptown. Amy and Richard went simple for their cake, but the results were still amazing. 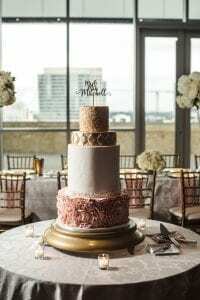 Wow Factor Cakes created this three tier beauty with a marble finish that stole the show during their fall wedding at The Ballentyne Country Club! Amanda and Justin went with an elegant lace detailed cake from Sweet Scene Cakes. 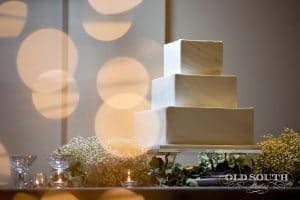 The delicate features really stood out among the industrial setting of their Bottle Factory wedding in Monroe, North Carolina. I think it’s safe to say we’ve seen some pretty amazing cakes! But then again we have some pretty amazing brides too! Want help making your big day perfect? Contact Magnificent Moments Weddings. We would love to help plan every detail!